The most happening brand in the mobile world, Samsung, has come out with a new marvel in the market named, the Samsung Galaxy Grand Quattro, with cool features, latest technology and upgraded Android version. 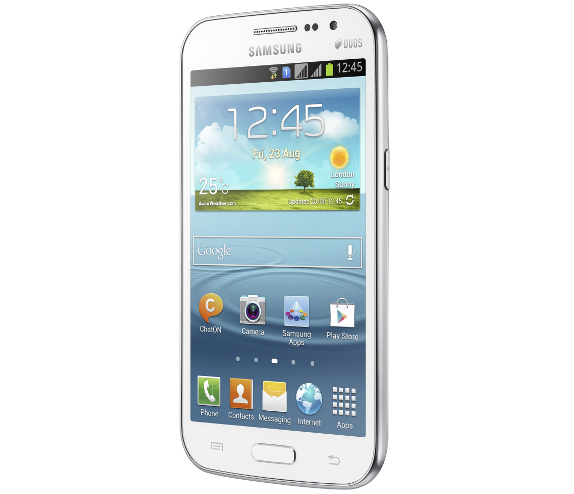 Samsung has always given something new to its users at affordable prices, and this time too, there is no exception. The most attractive fact about this gadget is that, the users will be able to experience all the specifications of Galaxy Grand in a small display size. Samsung mobile company has never disappointed its users regarding the features of its handsets, and the Samsung Galaxy Grand Quattro features is another example to prove it with a large 4.7inches TFT capacitive touch screen with a resolution of 480 X 800pixels. It gives wonderful picture quality with a 5megapixel rear camera that comes with LED flash and, 0.3megapixels front VGA camera for video calling and clicking one’s own pictures easily. The video quality is also satisfactory with a speed of 15fps and a resolution of 720pixels. It is a sleek phone with 133.3 x 70.7 x 9.7mm dimensions and 143.9g weight, making it quite handy for the user. It packs a Li-Ion 2000mAh battery, supporting 210 hours of stand-by time and 11 hours of talk time. Samsung Galaxy Grand Quattro pictures are available all over the web, which clearly depicts the availability of this phone in Ceramic White and Titan Grey colors. The dual SIM, GSM quad-band Smartphone gives a downloading speed of 7.2Mbps and uploading speed of 5.76Mbps and for connectivity, it supports GPRS, EDGE, Wi-Fi, and DLNA, helps connecting with other devices through Wi-Fi hotspot and Bluetooth v3.0. It has a huge storage capacity with inbuilt memory of 8GB and 1GB RAM, and a slot for microSD card for expanding the external storage capacity up to 32GB. It packs a quad-core 1GHz Cortex-A5 processor and Jelly Bean operating system, v4.1.2. The phone supports numerous applications like high definition games, YouTube, Facebook, Instragram, etc., making it the best choice of the new generation. The smartphone has been launched to provide the mini version of the best selling model of Samsung mobiles, Samsung Galaxy Grand, with some changes such as, the screen size of Quattro is smaller as compared to the 5inches screen of Grand, a bit weaker camera of 5megapixels whereas Grand has an 8megapixel camera. However, when it comes to the processor, Quattro wins the race with quad-core processor, while Grand packs a dual-core CPU. For more details about the latest, upcoming, and most popular mobiles, log on to www.pricedekho.com. Recently we shared a story a abot Lava mobiles that Lava introduces another quad-core smartphone and named it as Xolo Q1000.